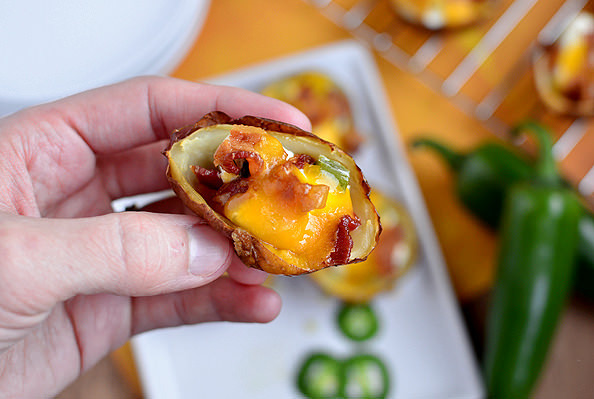 Proof that big things come in small packages, Roasted Jalapeno Popper Potato Skins combine the best of jalapeno poppers and potato skins. These creamy, spicy bites are a delicious and mouthwatering appetizer recipe! 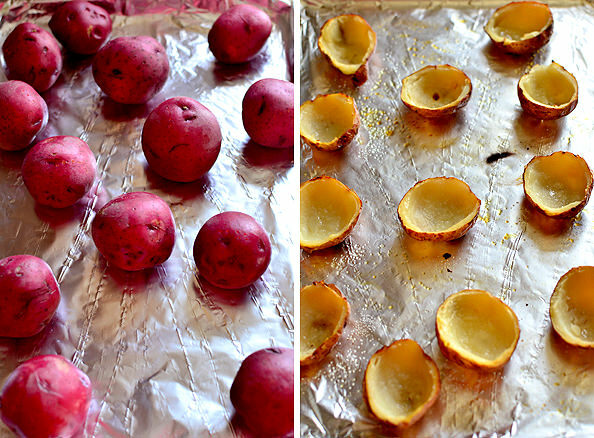 Baby red potatoes are baked in the oven then halved and scooped out to form bite-sized shells for a luxurious cream cheese and roasted jalapeno filling. You can find canned roasted jalapenos at the store, but making them at home is really easy, too. 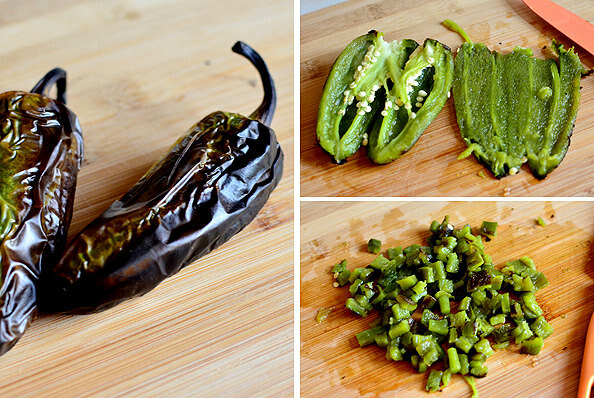 All you do it broil jalapenos until the skin turns black on all sides then steam in a paper bag for a few minutes. When they’re cool enough to handle, peel the skin away, discard the seeds, and chop! 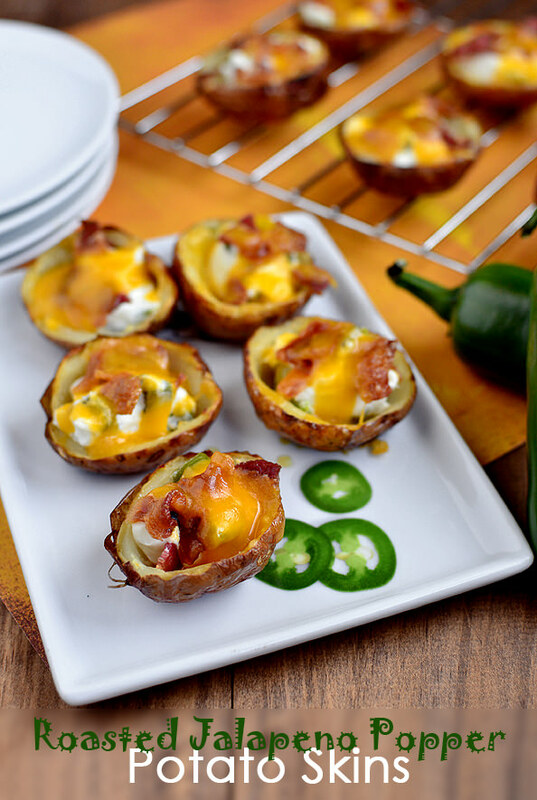 Topped with cooked and crumbled bacon, and a sprinkling of sharp cheddar cheese, these Roasted Jalapeno Popper Potato Skins are PERFECT for the Super Bowl – or any day, really. Enjoy! Place oven rack to center of oven then turn heat to 400 degrees. Wash and dry potatoes then prick once or twice with a fork. 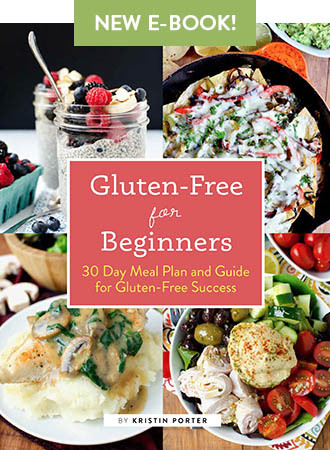 Place onto a foil-lined baking sheet then drizzle with 1 Tablespoon oil and coat all sides. Bake for 30 minutes, or until a knife inserted into the center goes in easily. Turn oven heat to 450 degrees. When potatoes are cool enough to handle, cut in half lengthwise then scoop out flesh, leaving 1/8″ potato inside the skin (save for mashed potatoes/other uses.) Brush insides with remaining oil then sprinkle with salt and bake for 10 minutes. 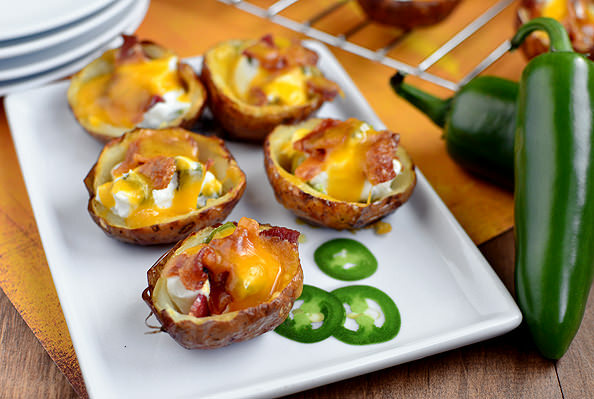 Fill each potato skin with 1 teaspoon roasted jalapeno cream cheese mixture, then top with bacon and shredded cheddar cheese. Broil for 1-2 minutes, or until cheese is melted.